Happy Pi Day! (3-14). What kind of pie are you making today? Ours is a California Avocado Yogurt Key Lime Pie. It’s a sweet and tangy pie, and the avocados give it a nice creamy texture. In fact, it’s about 3.14159 times better than your average pie! Place avocados in the bowl of a food processor with the yogurt, agave, lime zest, and vanilla extract; pulse until well combined. Scrape down the sides of the bowl as necessary. Set aside. Place the coconut milk in a small saucepan and bring to a low boil. Set aside. Place the lime juice in a large bowl. Sprinkle the gelatin over the juice and let stand 1 minute. Gently whisk in the hot coconut milk. Continue to whisk until the gelatin completely dissolves, about 5 minutes. Stir in the avocado mixture until well combined. Pour the mixture into a prepared pie crust (see below). Carefully transfer to the refrigerator and chill, uncovered, until firm, about 3 hours. Garnish with lime peel if desired. Preheat the oven to 350 degrees. In a large bowl, combine all of the ingredients and stir until well-mixed. Press mixture into a 9-inch pie pan. Bake for 12 minutes or until light golden brown. Remove from oven and let cool before adding filling. Looking for more fun avocado recipes? Check out the California Avocado Commission’s recipe page. 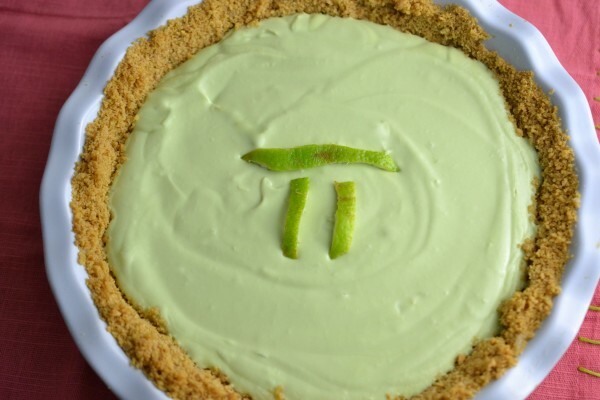 Looking for some fun Pi Day activities? Check out the Pi Day page. Forgot to mention that our 9-year-old did NOT know that there were avocados in there (he might have turned up his nose if he knew). It was just “Key Lime Pie” as far as he was concerned; he asked for seconds. I can imagine how the avocado would lend a very creamy consistency, but not a distinguishable flavor. I KNEW you would be all over pi day! Exactly right! It’s the lime that really comes through. Thanks for stopping by, Dorothy!